In this blog entry we will provide guidelines for the use of new and modified product-item data management services. Create products (all three types). The service can also be used to retrieve data that has already been created. Specify values of product dimensions for a product master. These values become available for the creation of product variants. The service can also be used to retrieve data that has already been created. Release distinct products and product masters. The service can also be used to retrieve data that has already been created. Release product variants. The service can also be used to retrieve data that has already been created. 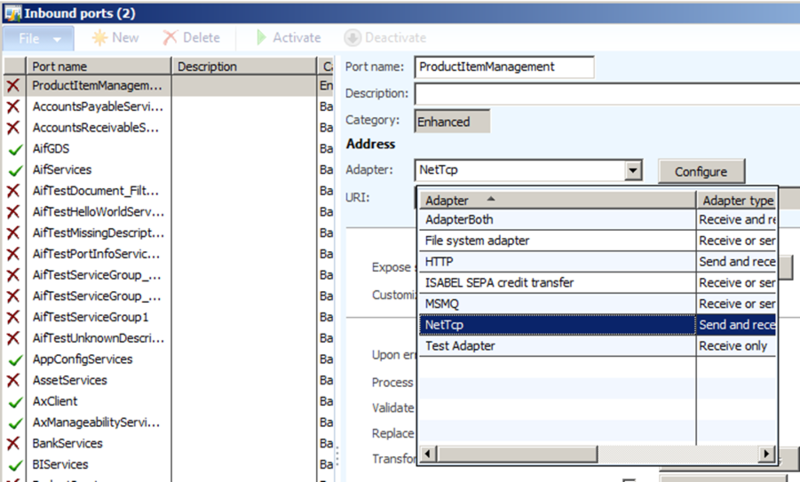 Product-item services must be enabled on an AIF inbound port before they can be used. 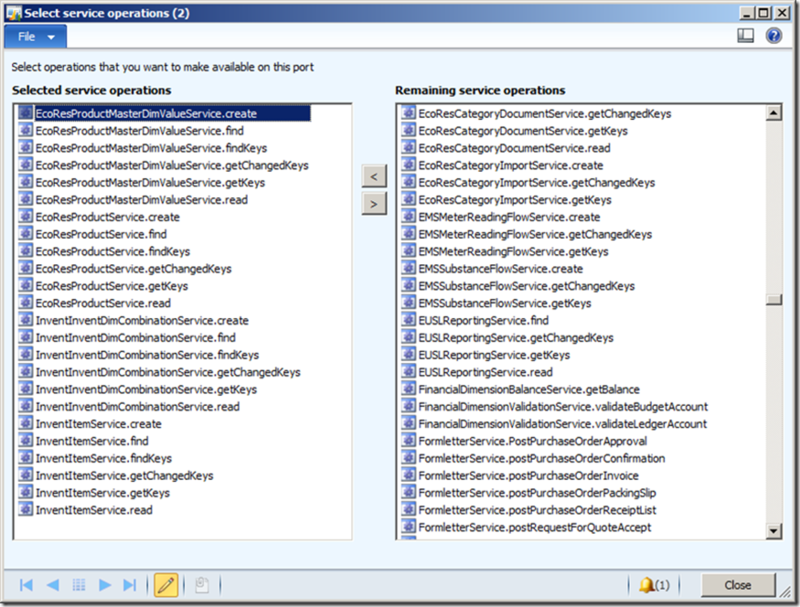 All services can be enabled on one port or several ports can be used. A port that uses a File system adapter. A port that uses a NetTcp adapter can be used to access services programmatically; for example, from a C# application. A port that uses a File system adapter can be used when input data is in the format of an XML document. 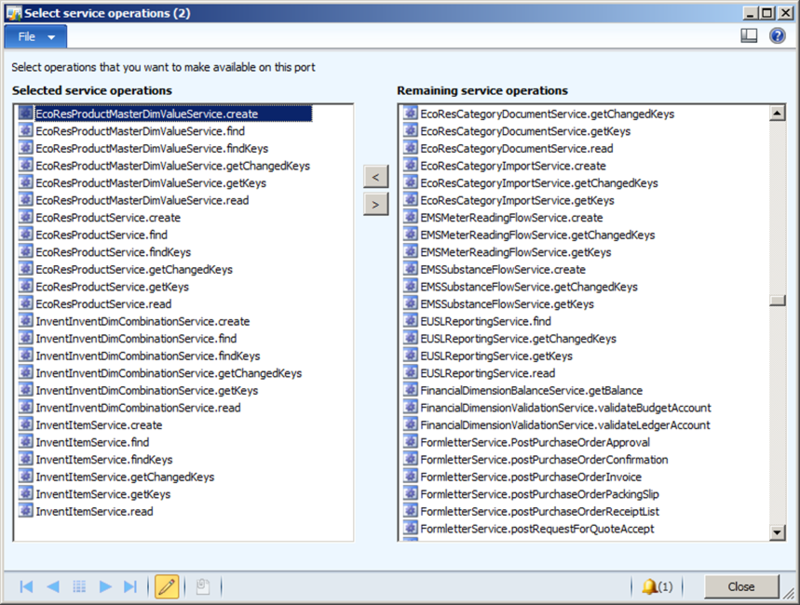 The following guidelines are based on the use of a default configuration of ports. 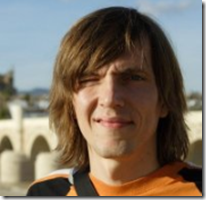 Advanced configuration of ports is beyond the scope of this article. 4. 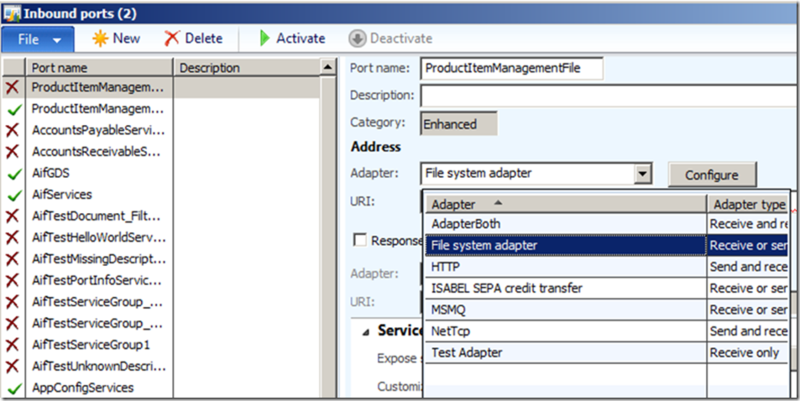 Click the Activate button in the action pane strip to activate the port. When the port has been activated, a control appears which displays the URI of a WSDL document for the service. This value can then be used for adding a service reference in Visual Studio. 3. Follow the guidelines in the previous procedure to specify the service operations that are going to be available on the port. Now you have two ports with product-item service operations available. Use the following guidelines to create and retrieve data. All types of products are created by using the EcoResProductService service. However, the methods to create a distinct product, a product master, and a product variant are different so each method is described separately. To create a distinct product, use the EcoResProductService.create operation. First, create a product using C# code, and then create an XML document with data to create a product. LanguageId = "en-us", Name = "Transparent Bulb 60W"
Product = "Bulb60W", StorageDimensionGroup = "Std-Dim"
Product = "Bulb60W", TrackingDimensionGroup = "Std-Dim"
As it appears, the create operation accepts an array of products so it is possible to create multiple products in one call to the service. The following XML code creates a distinct product. Note that storage and tracking dimension groups are specified. The storage and tracking dimension groups are not mandatory information to create a product so the C# code for the creation of a distinct product does not create these groups. The EcoResProduct element can contain multiple Product elements in order to create multiple products in one service call. To create a product master, use the EcoResProductService.create operation. 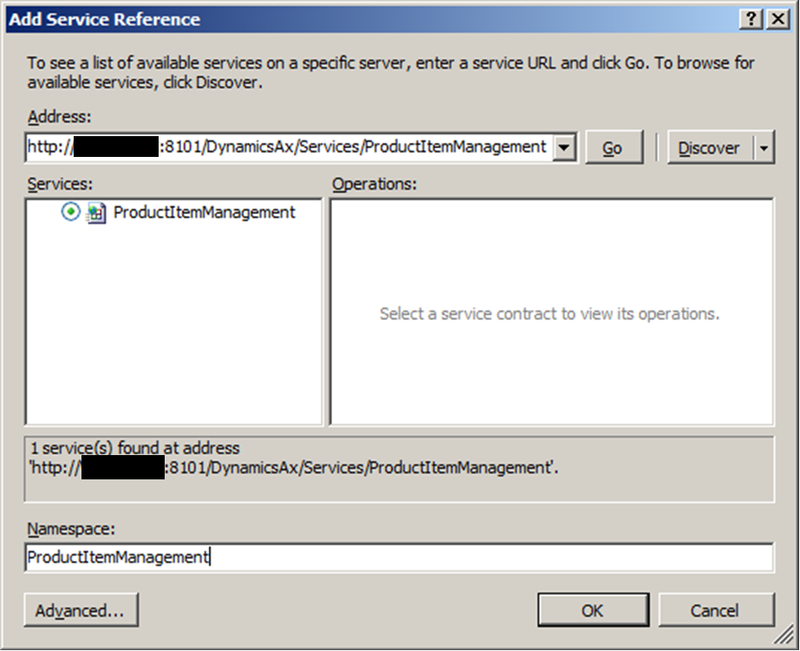 Then use the EcoResProductMasterDimValue.create operation to associate product dimension values with the product master. Finally, use the EcoResProductService.create operation again, this time to create a product variant. LanguageId = "en-us", Name = "Comfortable running shoe"
Product = "RunningShoe", ProductDimensionGroup = "Size-Dim"
Create a product variant with the size L for the product master. One thing that may not be obvious is the value required for the ProductDimensionAttribute field of the AxdEntity_VariantDimValue_EcoResProductVariantConfiguration, the AxdEntity_VariantDimValue_EcoResProductVariantSize, and the AxdEntity_VariantDimValue_EcoResProductVariant entities. The value must correspond to the IDs of the EcoResConfiguration, the EcoResSize, and the EcoResColor tables, respectively. LanguageId = "en-us", Name = "Comfortable running shoe L size"
A product must be released to a company before it can be used in that company. The ItemService and InventDimCombinationService serve this purpose. The former can be used to release distinct products and product masters. The latter can be used to release product variants. A product master must be released before any of its product variants can be released. ItemId = "Bulb60W", UnitId = "Box"
ItemId = "Bulb60W", UnitId = "Pcs"
A product variant can be released once a related product master has been released. When you release a product variant to a company, the product variant can be identified in two different ways. Use the product number of the product variant. Use the ID of the associated product master in the company (ItemId) and the InventDim structure with the relevant fields set to the dimension values for the variant (the ItemId/InventDim approach). For details, see the following examples. We hope that this blog post will help developers to better understand and use the services for the new product-item data model. More detailed information regarding the creation and release of products can be found in the Application user Help in the “Product information management” section. Further developer information about AIF and services can be found on MSDN.